If ever there was a pop up dinner that would be in my wheel house, The Future of Junk Food, a six-part pop-up put together by Chefs Samuel Monsour and Mark O’Leary, would be it. When thinking about my eating habits as a kid, it brings to mind an intriguing question: What if junk food wasn’t junk? It’s the question that Monsour and O’Leary are aiming to answer. I suppose its funny that I saved this interview, the third in a three part series on lineage and teaching in the kitchen (Part 1 | Part 2), for last. But, I thought it to be the most fitting conclusion. After all, speaking with the student always gives you a glimpse of the teacher. In speaking with Chefs Andrew and Brian, it’s clear to see that Chef Jody Adams is, in fact, exactly that. A teacher. The key component to any lineage, any strong legacy, is a passionate and knowledgeable teacher. Someone who can take that passion and knowledge, and transfer it to others. While its obvious that we could go much further back in time, for the sake of this discussion, it all starts with Chef Adams. Foodie Journal: When was it that you discovered that you had a love for food? Jody Adams: I can’t remember a time when I didn’t. When I was in high school, I cooked a lot. I didn’t just bake. I know baking is something kids do a lot, but I actually cooked. I spent a month in Morocco when I was 14, and I spent a lot of time in the kitchen there. Then, I spent a summer in Guatemala when I was 16, and spent a lot of time in the kitchen while I was there as well. My mother was a good cook, so by the time I got to high school I found that I was very comfortable in the kitchen. I didn’t have any expectations that it would become a profession for me, though. FJ: Was there a favorite dish that you enjoyed cooking? JA: I loved cooking an elaborate couscous. I also liked to make moussaka, or gnocchi. All kinds of things, really. FJ: You mentioned that you didn’t have expectations that food would become a profession for you, something evidenced by the fact that you have a degree in anthropology. When was it that a career as a cook became an option for you? JA: I was 25 years old. After graduating from Brown, I spent some time trying to decide what I wanted to do. I thought maybe I wanted to be a nurse practitioner, so I was back in school taking some science and nursing courses so that I could apply for a masters program. As I was doing it, though, I started to realize it wasn’t really compelling for me, you know? And, I just couldn’t start a life wondering, “Well, maybe.” So I ditched that. I’d been working at a gourmet food store, and for a catering company. I’d been working with food almost my entire life, and suddenly I realized, “Oh my god! There it is, right in front of me. This is what I’m supposed to do.” So I sent a bunch of applications out, and managed to get some interviews at some places around Boston. I was lucky enough to get hired by Lydia Shire at Seasons. FJ: Was working in a professional kitchen different from what you had experience up to that point? JA: It was a bit of a roller coaster for me in the beginning. Working for a gourmet food store, or a catering company, or at home is all very different from cooking in a fast paced restaurant. I didn’t cook fast, so I had to learn how to cook fast fast! FJ: You obviously picked up a lot of what you know about cooking while working in kitchens. Do you feel like you missed out on something by not getting the chance to go through culinary school, or was jumping right in to the mix the best education for you? JA: I think there are many ways to skin a cat. I don’t regret the liberal arts education that I went through. In fact, I think having the degree I have let me think about food a bit differently. Where it comes from? Why it evolved the way it has? I think it has served me very well in my style of cooking. I definitely have learned a lot on the job. [PAUSES] I don’t know how to do ice sculptures. JA: I don’t know how to do fancy garde manger work with gelatins and all that stuff, but I don’t miss that. I think that when you go to cooking school you get a foundation, sort of a toolbox of skills. I think for me, I just had to find that along the way. FJ: It sounds like learning, and teaching in a kitchen is a really important thing in the industry. Is that something you enjoy? JA: I’ve been at this for 30 years now, and that’s not how long I’ve loved cooking. That’s just how long I’ve been working in the industry, but for me it really holds the same excitement. I actually went to visit my son in New York recently, and he had some of his friends over. So my daughter and I took some food, and we cooked at his apartment. We made short ribs, and mashed potatoes, and bok choy and kimchii. We drank lots of beer. It was just fabulous for me, being able to cook with these young people and teach how to put things together. So, it still really excites me at that level. I’m very connected to it at its core, how exciting it is to teach people how to cook. I teach cooking classes once a month at the restaurant, and my husband and I have a blog we do to teach recipes for the home cook called The Garum Factory. So, I stay very connected to the whole idea of teaching. FJ: My final question for you, Jody. Everyone that loves food typically has a particular food memory that they love as well. What’s yours? JA: Many, but I can tell you one. I was in Palermo. I was alone, waiting for a friend of mine that was flying in that evening, so I had the day to myself. I looked down an alley and saw a guy leaning over a little grill. He had this little tiny grill set up with artichokes in the coals, and he was grilling sausages. So we started talking a little. My Italian is not great, and he didn’t speak English, but we still managed. I asked him what he was doing, and he tried to explain it to me, and suddenly it was like I was in a movie. The window shutters across the way opened. This woman leaned out, clearly his wife. Then three of his adult children popped their heads out the window, and there was all this conversation back and forth. Out of nowhere they brought out a chair and made me sit down. They brought out a plate. They got me some warm Coke, and they fed me right there in the alley. He was obviously cooking dinner for them! They were about to have their family dinner. I was a perfect stranger to him, but there it was. Those are the kind of memories that I have. My memories are always of very simple expressions of hospitality, with delicious, simple food. The artichokes were unbelievable. They were charred, and they were yummy, and all it involved was just artichokes cooked in coals. Simple. Jody Adams is chef and co-owner of restaurants Rialto, and Trade. Rialto is located at 1 Bennett Street, Harvard Square, in Cambridge, Massachusetts. Trade is located at 540 Atlantic Avenue in Boston. In the first part of this interview series, we got to know Andrew Hebert, the Executive Chef of Jody Adams’ newest restaurant in Boston. 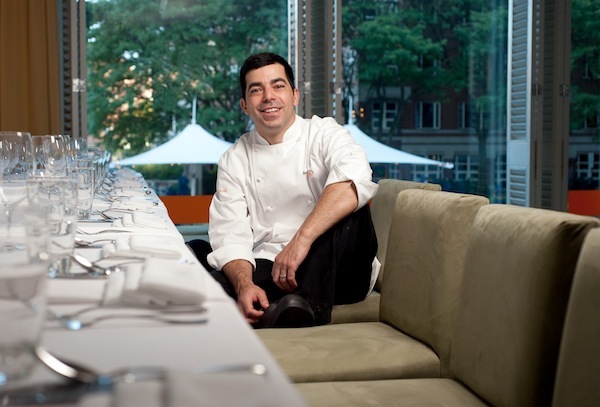 Trade opened to much fanfare, and went on to be voted Boston Magazine’s Best New Restaurant of 2012. The award serves as testament both to the team responsible for the work that goes on day-in and day-out at Trade, and also to just how strong a factor lineage can be. Chef Adams established the ethic; the way to get things done. Chef Hebert carries that torch, and with much success. Long before Trade, there was Rialto. Helping to keep the home fires burning is Chef de Cuisine Brian Rae. Rialto has become an institution in Cambridge, Massachusetts. Not only can you sit down to enjoy a meal, a mix of local ingredients prepared with traditional Italian culinary techniques, but you can learn to make your own. Rialto offers up cooking classes, open to anyone wanting to learn. Teaching is in the fabric of this restaurant, and those that work there. It is one of just a few things that came up during my conversation with Brian Rae. Foodie Journal: At what point did you discover that you had a love for food, and wanted to turn it in to a career? Brian Rae: Well, I went in to culinary school straight out of high school. So, I guess it was in high school, really. I used to work in delis, restaurants, and catering companies when I was in high school. So I think it just developed there. FJ: And, you went to the Culinary Institute of America, right? FJ: Can you speak a little about how you think culinary school can be beneficial for someone making the decision to get in to the food industry? BR: Well, I feel like culinary school is great for someone just coming out of high school. They’re used to learning in that classroom environment, and culinary school really can expose you a large variety of things in a very short amount of time. I don’t think it’s the only way to become a cook, but it’s a good option. FJ: What do you think are the differences between someone that just jumps in feet first, learning while they work in a restaurant, versus someone that went for a more formal culinary education? BR: I think that eventually you have to jump in, regardless. It’s a process you have to go through. Even when you’re coming out of culinary school, you’re still very, very green. Going to culinary school does expose you to a lot of things, but its not like you’ve had the opportunity to do them so many times that you can say you’re an expert in something. You’re still very much a beginner. But, going to culinary school can at least help to expose you to what all the possible options are in the industry and really help you decide which direction you want to take your career. FJ: So rather than mucking about, unsure of what career path they want to take in the industry, a culinary student might have a better sense of direction. Know where they want to head? BR: Yeah, exactly. It gives you a little perspective. FJ: Once you graduated from the CIA, where do you get your start restaurant wise? BR: I went to Nantucket, and ended up working at a place called the Straight Wharf Restaurant for several summers. After culinary school I actually went on to a regular college, believe it or not. So while I was doing that, I would work at the Straight Wharf during the summers. FJ: In reading a little about you, I saw that you went out to Las Vegas and actually were named Las Vegas Rising Star Chef. BR: Yeah, that was a few years ago. FJ: Does winning an award, any award, change how you approach being a chef? BR: Well, any award, I think, increases the pressure. It increases the expectations people might have when they’re coming in and are going to try your food. So, you do have to kind of up your game. The more recognition, the better you have to be. That’s ultimately what people expect. But, I really love the scene. I loved Las Vegas. FJ: What was the lure to bring you back to New England having been there? BR: There were a couple of issues, really. My wife and I are both from New England originally, so being away from family was tough. The economic downturn, though, really played a big part. There was a lot of belt-tightening going on in the casinos, and by extension in the restaurants as well. So, things kind of started to get a little weird. It just made sense at that time to come back east. FJ: When you made your way back to the New England, you ended up work at Rialto. Can you talk a little about the team there, and having the opportunity to work with Chef Jody Adams? BR: When I got back east, I was real happy to be somewhere that had so many local farms and producers. Las Vegas has some, but not nearly as many as we have here. So, it was really nice coming in to Rialto where Jody already had connections with so many different local vendors and farmers. It was really easy to find my way in getting all these great local products. The team at Rialto is great. We have a 20-year history, so there are a lot of people that have come through the restaurant that respect and love it. The team we have right now is really great. We’re all friends that get along, and are there because we love food. It’s not a job so much as it is something that we just love to do. I think we do a good job of reflecting Jody’s love and passion. FJ: I know that Chef Adams loves sharing her passion for food with others, teaching them how to do things in the kitchen. A great example of that are the cooking classes that are held at Rialto. As a person at the head of a kitchen, how important is it to be a teacher? BR: It’s one of the keys to running successful restaurants. You have to train your cooks. Teaching is a necessity. You also have to hire people that are willing to be trained. I just don’t think there is any other way to do it. You have to do things that way, or else you’re not going to be successful. FJ: Is it something you enjoy? BR: Yeah! I love putting a cook on to a new station. They might be nervous, some might be confident, but its fun to work with them during those first few days. Then when they make it through a busy night on their own, it’s a great thing to see. Reminds me of when I was a bit younger. I love talking about being a line cook. So, yeah, it’s a lot of fun. FJ: Final question for you… do you have a food memory that you really love? BJ: I always look forward to Christmas Eve dinner. My family kind of always does its version of the Italian ‘Feast of the Seven Fishes’. It’s always my favorite meal of the year with my family. We have all sorts of things, like lobster, it’s just a great meal. It’s course, after course, after course. It goes for at least 3 hours. That’s probably one of my favorite food memories. It’s actually possibly the best kind of memory since it keeps repeating! Brian Rae is the Chef de Cuisine at Rialto Restaurant. Rialto is located at 1 Bennett Street, Harvard Square, in Cambridge, Massachusetts.